Posted under Health Guides. Updated 17 August 2017. Weight loss with fad diets is usually temporary. Fad diets can be harmful to your body. The best way to lose weight and keep it off is by making small changes such as avoiding sugary beverages, watching your portions, eating more fruits and vegetables, and exercising more. Fad diets are marketed as quick ways to lose weight. The most popular fads tend to change from year to year, but the promises they make don’t. Diets such as the ketogenic diet, the whole 30, the paleo diet, juice cleanses and even intermittent fasting are all fads. Some people will lose weight while following a fad diet, but most fad diets are impossible to stick to for long. This means that once you stop following the diet, you’ll probably gain back the weight you lost. Some people actually gain back more weight than they started with. Fad diets don’t usually provide enough vitamins and minerals, such as iron, calcium and vitamin D. Iron is important for red cells in your blood and calcium and vitamin D are important for healthy bones. 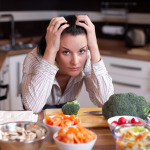 How can you spot a fad diet? Does this diet make some foods completely off-limits? Does this diet promise that I will lose an unrealistic amount of weight in a short amount of time? For example: “ten pounds in one week”. Does the diet refer to foods as “good” or “bad”? Do I have to buy certain foods for this diet at a special store? Does the diet claim I can lose weight without exercising? If you answered “yes” to any of these questions, you’ve probably spotted a fad diet. Advertising that promotes these diets is often very convincing. These ads may draw you in and make you believe that it’s super easy to follow the diet and lose weight. Don’t be fooled. This type of weight loss plan is not a healthy way to lose weight. Should I take diet pills or supplements that promise weight loss? It’s not safe for teenagers to take “diet pills.” Over the counter supplements are especially not safe for weight loss because they are not regulated by the Food and Drug Administration (FDA). The FDA is the government organization that makes sure that the food we eat and the medicine we take is safe. However, supplements are not regulated so they could be harmful. Are there healthier ways to manage weight? Yes! There are much healthier ways to manage weight rather than following a fad diet. We lose weight by eating fewer calories than our bodies burn. To lose weight, add calorie-burning activities into your day, and cut down on the calories you eat. Because a large decrease in your calories can be harmful to your body, try small dietary changes like the suggestions below. Choosing less sugary beverages. Drinks such as soda and juice are loaded with sugar and empty calories. Try tap water, seltzer water, or no calorie flavoring packets instead! Eating breakfast. Starting your day with a nutritious meal will prevent you from getting too hungry during the day and will give you energy to think at school. Packing fruit for a snack. Choosing fruit over chips or candy will provide your body with important nutrients. Eating more whole grains. Choose whole grain bread, whole grain pasta, brown rice, and high-fiber cereals. They are more filling than refined grains such as cookies and pastries. Choosing lean proteins. Chicken, turkey, fish and vegetarian sources of protein, such as beans and tofu, contain less fat than other proteins. Eating more servings of fruit and/or vegetables. Aim to include one or both at most meals and for snacks. Watching your portion sizes. Choose regular portions, not super-sized ones. Eat only until you feel satisfied. Is there a way to tell if a diet is healthy? If your weight loss plan includes all of the above, it’s likely a healthy approach. Remember to eat a variety of foods from all the food groups. Choose healthy portion sizes and eat fruits and vegetables from all the colors of the rainbow to get important nutrients for your body. Try to do 60 minutes of exercise most days of the week. It is okay to eat treats once in a while. Making these healthy changes will help you to lose weight, and keep the weight off. If you have questions about whether or not a diet is healthy, talk with your health care provider who might refer you to see a registered dietitian. A registered dietitian is a specialist on the topic of nutrition and can help you figure out an eating plan that is healthy, balanced, and appealing to you. I’m just wondering if it’s ok to take diet pills at the age of 13. I’ve been thinking of using ones that are called ‘Garcinia Cambogia’.